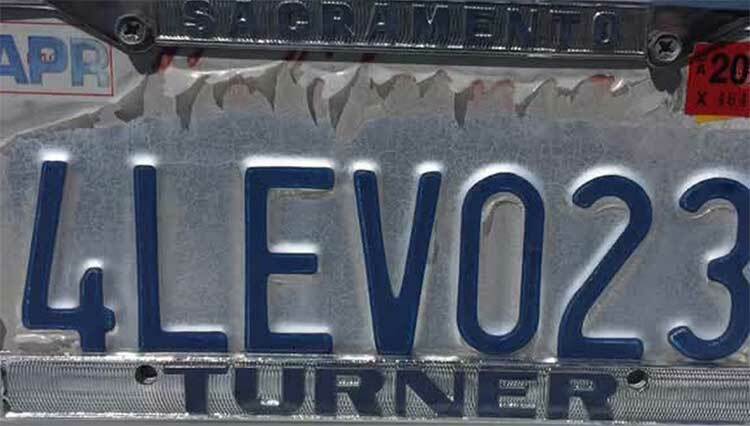 When’s the last time you took a good look at your car’s license plate? Probably not since you put the registration sticker on it, right? Well, you might want to take a closer look at it today because it could get you pulled over and ticketed. That’s right, just like that burned out brake light you didn’t know about, you now have to worry about the condition of your license plate and here’s why. Whether you realize it or not, the condition of your license plate may give police a reason to pull you over. This is because it is illegal to purposely alter the condition of your plate. Attempting to deface, modify, or customize a state license plate can earn you a citation, fine, or misdemeanor. Some unsavory types may alter their plates to throw off police, but this is harder to get away with due to new plate defacing laws. If you are not one of those unsavory types, you may still be breaking the law without even knowing it. Driving with a plate that is damaged, covered up, or just so old that the numbers cannot be read may also be illegal. For more than a century, license plates have been made of aluminum with the characters embossed on them with a press. The raised impressions are then painted and baked onto the metal. While some states still use this process, many states now print their plates digitally, which is faster, cheaper, and allows for a wider variety of styles. Modern plates have security seals and authenticity threads embedded into them, much like you might find in paper money, to assure authenticity. In both methods, a plastic laminate covering is applied to the plate that has a reflective coating. This reflective coating has a very specific purpose. It enables traffic cameras and police plate scanners to recognize and capture plate numbers as they pass by. The benefit of this is that vehicles can more easily be identified when in connection with a crime, such as child abductions. However, depending on the state, your daily activities may be tracked on state computers, allowing police officers to know where you have been recently. So, the next time a police officer asks you where you’re coming from, you may want to think twice before lying because he might already know. In some states, drivers are getting fined for damaged plates through no fault of their own. This is because some plates were manufactured with defective materials. Unfortunately, many states are having issues with the laminate sheeting that has been used in plate production over the last decade. While this laminate is meant to protect license plates from weather damage, some drivers are finding out the hard way that their plates are peeling, bubbling, and cracking, which is causing them to get pulled over. Initially, police assumed that drivers were intentionally trying to remove the plastic from their plates, but it soon became apparent that these plates were actually defective. In California, New York, and Illinois, damaged plate citations were being issued to unknowing drivers. These states realized that they were not experiencing a rash of license defacing hooligans, but that something went wrong during manufacturing. Well, the first thing you should do is go out and check your own license plate for signs of damage. Make sure the plastic coating is not bubbling, peeling, or cracking. If you notice any damage, contact your local tag office to find out how you can receive a replacement plate. Remove stickers, frames, or covers that might be interfering with digital plate readers. You may also want to clean off a dirty plate to make sure that numbers, letters, and registration tags can clearly be seen. Maybe you are reading this article because you have already been cited for a damaged or defaced plate and are facing fines. Don’t panic, Improv Traffic School is here to help! If you receive a ticket for this or other traffic violations, your state’s traffic court may allow you to attend traffic school instead of having to pay the fine. This might also earn you a discount on car insurance and just make you a better overall driver.